Get One Into His or Her Hands Today! 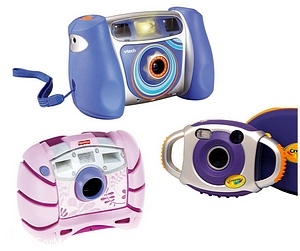 A kid digital camera can be a tough choice. Does he or she have the ability to care for a relatively expensive item? Any rough play tendencies? Will their sense of responsibility and your comfort level on the price you will pay go together? Don't make "made for kids" turn into "made for the back of the drawer". Lightweight and easy to stuff in a pocket or carry on a strap with little hands. Rugged and durable and has a large LCD viewer so they can easily see the picture after they have taken one. RCA plugs so they can show off their work by plugging directly into your TV. Video capability. Encourage imagination and short, commercial length movies with a story. No matter how it turns out, give compliments and encourage the creativity. Ability to charge from a USB port or that uses rechargeable batteries and will upload to your computer easily. Water resistance level is important for potential play on wet lawns, pools and sandy beaches. Finally, be aware that there is a trend toward providing fun features that have the ability to include sound effects or colorful background images but to repeat, make sure it can take a good photo. The cameras will come and go yet those photos will remain! Starting simple with a kid digital camera seems obvious but technology moves so rapidly in today's market, that it really is okay. Consider any purchase as an investment in the well being and self esteem growth of your child and just make sure it "takes" good pictures. Your 5 year old just might snap the shots that become your best family photos. At an early age, you will be surprised at how easily your child can catch on to photography. Sometimes, LESS instruction is MORE. Turn it off and on, demonstrate how it zooms in and out, show how to "frame" the photo they want to take, have them hold their arms still as they press down on the shutter, then cut them loose a bit and you will discover what they see as important in their world. Consider adding a Smile For Me Toys™ Birdie . They are a "cheep" insurance policy to make it fun to smile for any kid digital camera that you purchase. Stick the birdie on their camera and watch how quickly the show begins! It's like adding a free photography lesson. Have them say "watch the birdie" to your gathered family and you can seize the day in photos!